This paper about citizen initative was introduced in one of the 18th IOPD International Conference roundtables. It was written by Pau Alarcón, professor at the Pompeu Fabra University; Patricia García Espín, researcher at the Instituto de Estudios Avanzados-CSIC; Joan Font, researcher and director of the Instituto de Estudios Avanzados-CSIC; and Yanina Welp, main researcher of the Centre for Democracy Studies at the Zurich University. 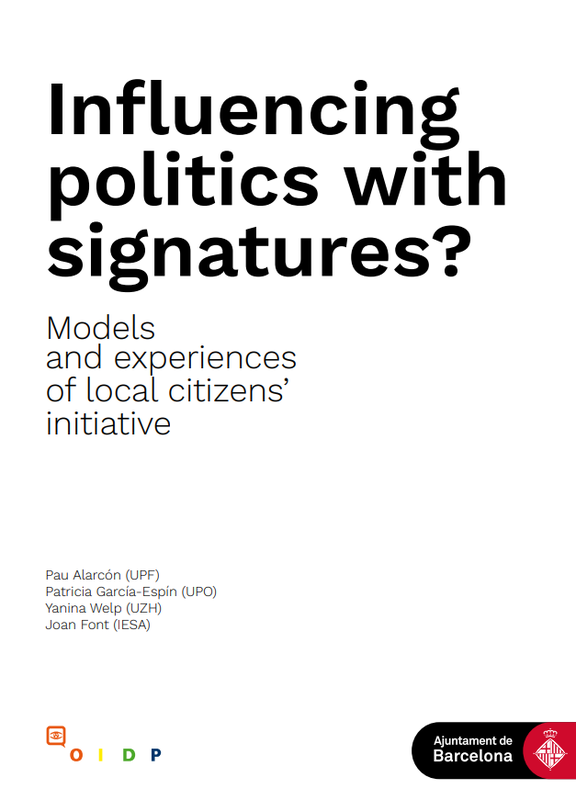 The study seeks to contribute to the knowledge and reflection upon the participatory tools that enable citizens to initiate a process of signature collection, with the aim of influencing municipal institutions. These participatory tools haven't been object of study at the local level and, if they are well designed, they can open new channels for social implication. The study has counted on the support of the IOPD and the Barcelona City Council.